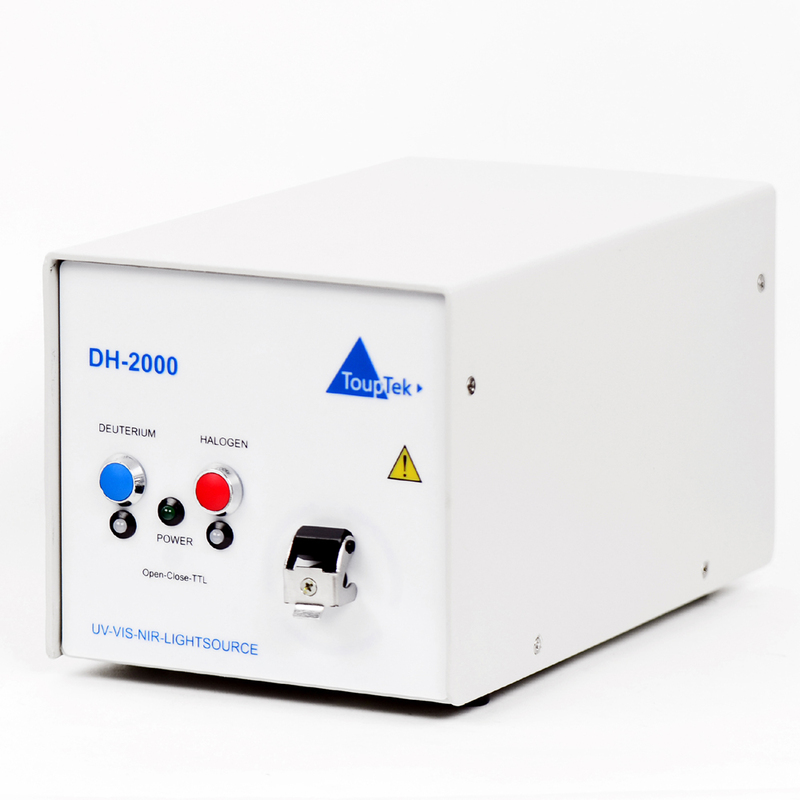 The TPDH-2000 Deuterium Tungsten Halogen Light Source combines the continuous spectrum of deuterium and tungsten halogen light sources in a single optical path. The combined-spectrum light source produces a powerful, stable output from 215-2500 nm. In addition, deep-UV versions of the light source are available, providing a 190-2500 nm wavelength range. Integrated shutters are also available with the TPDH-2000and can be driven either by a switch or by a TTL signal. Another option is to include a filter holder with the system, which accepts filters up to 4 mm in thickness and as large as 25-mm square or 20-mm round in diameter. All versions of the TPDH-2000have an SMA 905 Connector for easy coupling to our spectrometers and accessories via optical fiber, and a safety shutter for blocking the light when the fiber is not attached. 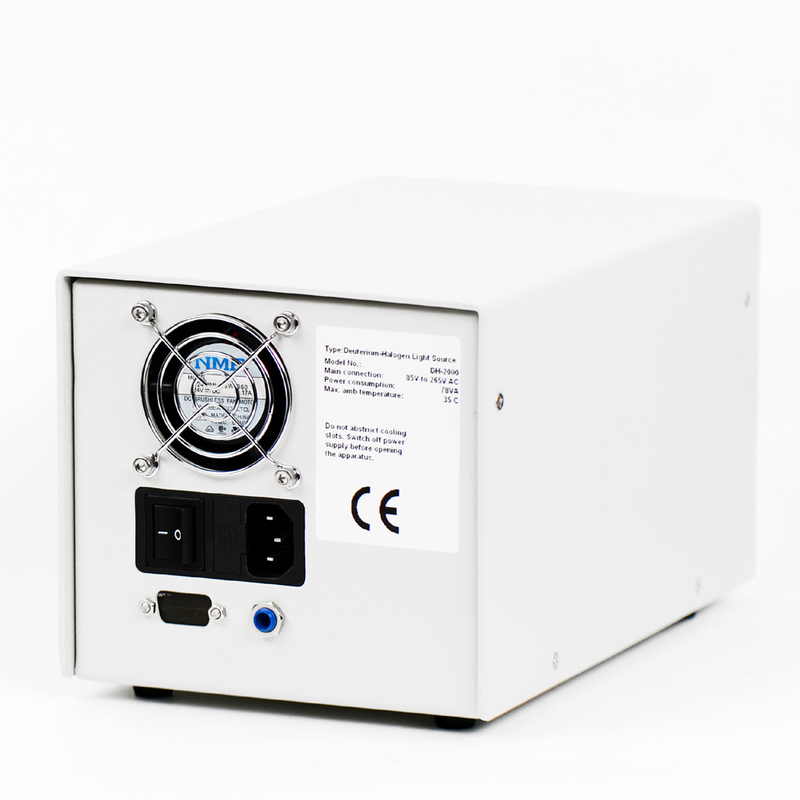 All versions of the TPDH-2000 have a potentiometer on the back of the light source to balance the light level between the deuterium and tungsten halogen light sources. This potentiometer allows you to adjust the optical power of the tungsten halogen light from 10-100%. We recommend using our solarization-resistant optical fibers with all versions of the TPDH-2000. 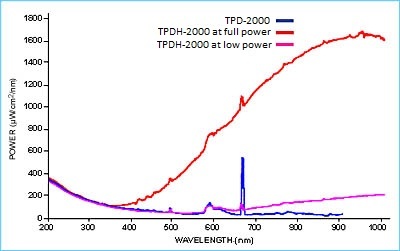 This spectral output graph shows the output of the TPDH-2000(red) at full power and the TPDH-2000 with the tungsten halogen at low power (pink), TPDH-2000(blue). The height of the deuterium atomic emission line depends on the optical resolution of the spectrometer.